It was a little after four thirty in the morning. I was at work, cleaning the kitchen in the apartment where my clients live, having just finished making lasagna for their weekend meals. All of the sudden, I was having a hard time keeping my balance. Now granted, I do have a balance problem which is connected to my deafness, but this was more than that. And since I reserve any drinking I do for my days off (besides, I’m not that big of a drinker anyway), I knew I couldn’t blame my unsteadiness on alcohol. This wasn’t the normal shaking that one might feel when a semi passes by your home. Besides, the apartment was in a large complex away from any major traffic, so there wouldn’t be any large trucks outside the door. This was something that actually made the furniture shift a couple of inches. I immediately went outside, only to find that the neighbors were also outside standing around in the parking lot, with the same puzzled expressions as myself. Obviously I wasn’t the only one who had felt the trembling. Since the apartment was located close to the airport, the first thing that went through my mind was a possible plane crash. But I didn’t see anything that looked like a fire, and the neighbors didn’t hear any sirens. So I went back inside, only to discover that my clients (both of whom are developmentally disabled and mentally retarded) had woken up, and were freaking out in the living room. They couldn’t understand why someone would come in and shake their beds. After calming them down and escorting them back to their rooms, where they looked upon their mattresses with nervous suspicion before finally climbing back under the sheets, I grabbed my trusty SideKick and put in an emergency text message to the office. Yup, folks… southern Indiana got visited with an earthquake this morning. According to the U.S. Geological Survey, the quake registered 5.2 on the Richter scale… not all that impressive when compared to Los Angeles earthquake of 1994, which measured 6.7… or the Alaskan earthquake of 1964, which measured 8.4 on the scale. Nevertheless, it was still strong enough to put cracks up a schoolhouse in West Salem, Illinois, which was close to the epicenter of the earthquake… less than sixty miles away from Evansville. It also did some damage as far away as Louisville, Kentucky – a good two to three hours to the east. And of course, to rattle a couple of people’s nerves. An earthquake in the Midwest??? Actually, it shouldn’t be all that surprising. The area around the Mississippi River between Saint Louis and Memphis is home to the New Madrid Seismic Zone, the most seismically active area in the country east of the Rocky Mountains. Some scientists predict that the next “big quake” won’t happen in California or Alaska – both known for their earthquake activity. It will happen right in the nation’s heartland. Indeed, major earthquakes estimated to have registered around 8.0 or higher did occur here back in 1811 and 1812, which changed the course of the Mississippi River and entirely destroyed a town which is now underwater. It is estimated that a serious earthquake in the New Madrid Fault Zone could actually devastate 65% of the city of Memphis in Tennessee and do significant damage elsewhere as well. We ended up having an aftershock later in the morning around 10:15 which registered 4.6 on the scale. 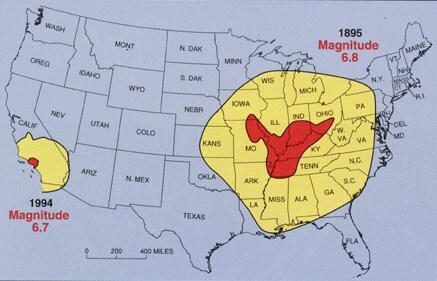 The morning’s earthquake is said to have been felt as far away as Chicago, Kansas City, and Memphis. It’s not the first time I have felt an earthquake, but it hasn’t been a common occurrence in my life. I can’t say that it’s something I would care to repeat. But at least we can be thankful that there was minimal damage and no report of injuries. Next time we might not be so lucky. Shook Fyre and I out of a sound sleep this morning that’s for sure. The cat’s have not been happy about all this rocking and rolling either. Ghost runs for his hiding place under the dresser and Shadow stands in the middle of the room with her fur all puffed out and growling. whoa osh hey i felt one of those in richmond calif i was bout 16 was woke at night like your clients, then it quit so i got up to use the rest room and aftershock got my fanny scared the crap outta me but then it quit so i just went back to bed after my mom got me to calm down. scary thing when mother nature decides to dance. There were reports that people felt it here in Alabama, as well as Atlanta, too…. I remember a few years ago we had one that woke me up, and my first thought was “Tornado”!! Living where I do, that is usually the only thing that shakes buildings!!! But, yes, we actually have them, and I don’t like them!!! Good post. Always enjoy your writing. I slept through them in CA, let alone in MI. Never have realized the experience. After being in the epicenter of the Whitter Earthquake years ago, I think I sleep through most now. Of course with 3 young kidlets running around, earthquakes are quite common at my house. That must be a confusing experience since it may be the last thing anyone would think that was an earthquake especially in the Midwest area. Glad you are okay! An act of mother nature does wonders!